Beam's SatDOCK vehicle hands-free docking station provides a high quality semi-permanent installation for the Iridium 9555 satellite phone. We don't offer this item any longer, however, a comparable SATTRANS Iridium 9555 Vehicle Docking Station is available for immediate shipping. 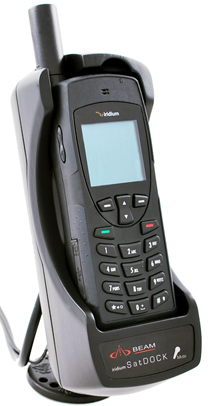 The Iridium phone fits securely in the dock, which features USB and serial data connectivity, phone charging, data and power connection. SatDOCK also supports the use of an optional Iridium DPL Intelligent Handset that replicates the full functionality of the 9555 handset in another location.